Simon & Schuster, 9781451654974, 411pp. The "brilliant" and "daringly original" (The New York Times) critique of digital networks from the "David Foster Wallace of tech" (London Evening Standard)--asserting that to fix our economy, we must fix our information economy. Jaron Lanier is the father of virtual reality and one of the world's most brilliant thinkers. Who Owns the Future? is his visionary reckoning with the most urgent economic and social trend of our age: the poisonous concentration of money and power in our digital networks. Lanier has predicted how technology will transform our humanity for decades, and his insight has never been more urgently needed. He shows how Siren Servers, which exploit big data and the free sharing of information, led our economy into recession, imperiled personal privacy, and hollowed out the middle class. The networks that define our world--including social media, financial institutions, and intelligence agencies--now threaten to destroy it. "Lanier has a mind as boundless as the internet . . . [He is] the David Foster Wallace of tech." "Everyone complains about the Internet, but no one does anything about it . . . except for Jaron Lanier." 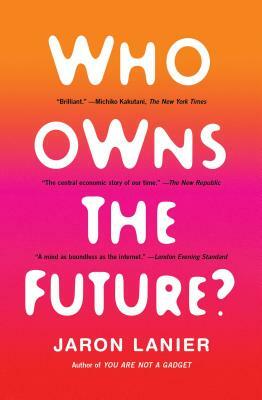 "Who Owns the Future? is a deeply original and sometimes startling read. Lanier does not simply question the dominant narrative of our times, but picks it up by the neck and shakes it. A refreshing and important book that will make you see the world differently." "One of the triumphs of Lanier's intelligent and subtle book is its inspiring portrait of the kind of people that a democratic information economy would produce. His vision implies that if we are allowed to lead absorbing, properly remunerated lives, we will likewise outgrow our addiction to consumerism and technology."